THE VELOCITY OF LIGHT IN THE MAGNETIC FIELD. By Henry T. Eddy, Edward W. Morley, and Dayton C. Miller. 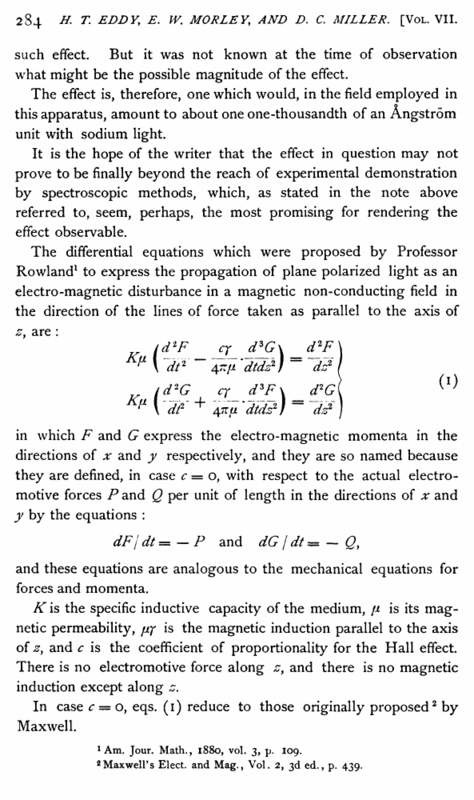 Upon the Electromagnetic Theory of the Rotation of the Plane of Polarization in a Magnetic Field. IN a note upon this subject read before Section B at the Toronto meeting of the A. A. A. S., August, 1889,1 the present writer developed the essential points in the present paper with the exception of the numerical estimate of the amount of the suspected effect. 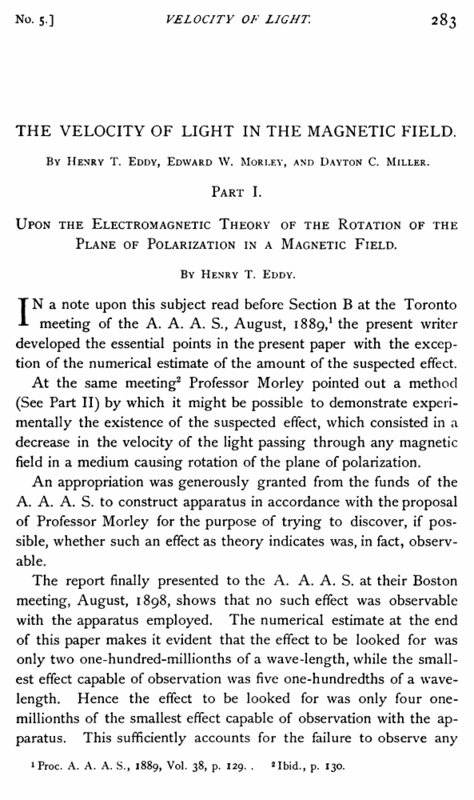 At the same meeting2 Professor Morley pointed out a method (See Part II) by which it might be possible to demonstrate experimentally the existence of the suspected effect, which consisted in a decrease in the velocity of the light passing through any magnetic field in a medium causing rotation of the plane of polarization. An appropriation was generously granted from the funds of the A. A. A. S. to construct apparatus in accordance with the proposal of Professor Morley for the purpose of trying to discover, if possible, whether such an effect as theory indicates was, in fact, observable. 1 Proc. A. A. A. S., 1889, Vol. 38, p. 129. . 2Ibid., p. 130.
such effect. But it was not known at the time of observation what might be the possible magnitude of the effect. The effect is, therefore, one which would, in the field employed in this apparatus, amount to about one one-thousandth of an Angstrom unit with sodium light. It is the hope of the writer that the effect in question may not prove to be finally beyond the reach of experimental demonstration by spectroscopic methods, which, as stated in the note above referred to, seem, perhaps, the most promising for rendering the effect observable. and these equations are analogous to the mechanical equations for forces and momenta. K is the specific inductive capacity of the medium, fi is its magnetic permeability, fiy is the magnetic induction parallel to the axis of zy and c is the coefficient of proportionality for the Hall effect There is no electromotive force along zy and there is no magnetic induction except along z. In case c = o, eqs. (1) reduce to those originally proposed2 by Maxwell. 1 Am. Jour. Math., 1880, vol. 3, p. 109. 2Maxwell’s Elect, and Mag., Vol. 2, 3d ed., p. 439.